Posted December 7th, 2012 by Adam & filed under Codastar News. With Linkedin’s recent roll-out of the new look company pages (read more about Linkedin’s New Look for Company Pages here) they’ve thrown a new look for their personal pages into the mix to keep the biggest professional networking site looking funky and fresh and optimised for your personal success. Want to know more? Then look no further, as we round up all there is to know about the new Personal Profiles. 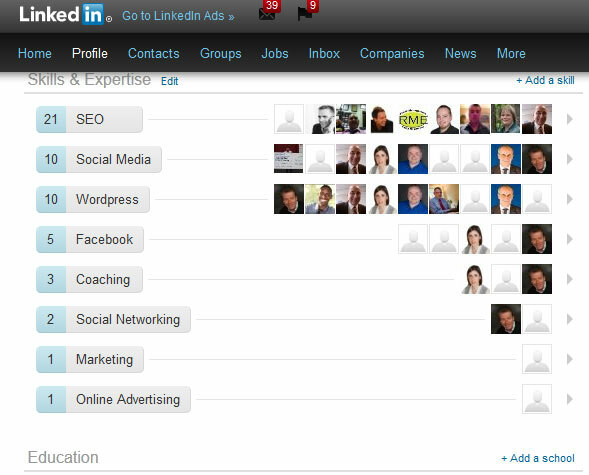 Well, the changes aren’t massive – arguably the profile components are the same, however the new profile is more organised, and put together in a slicker and simpler visual layout putting greater focus and emphasis on content and connections – the two elements that are the basis of Linkedin’s overall success. For us, we see this as one of the most important update of the new profiles. The new design helps you make a more powerful first impression; which we all know in business on or offline is incredibly important. The layout allows you to showcase skills, accomplishments and current projects you are working on, as well as added endorsements from your connections in areas they find you most competent. Including current projects adds a valuable dimension to your otherwise static page; allowing connections to really see what it is you ‘do’ and how you do it. This is not only vital for potential recruitment opportunities in the future; but for the ultimate in networking and showing off not just your company, but your own skills, creating new business opportunities. So often on Linkedin, once you have made a connection with someone, it falls to the wayside and you very rarely engage with them again. The new profile shows far more rich and visual insights on not only the people, but the companies in your network. This not only will increase engagement with those in your network; but these insights make it easier and simpler to discover people outside of your network, quickly establishing a common ground to make more meaningful and profitable connections. Finding this ‘common ground’ is a fantastic first step in building not only personal contacts; but professional ones too – heading in the right direction of making long term connections with mutual interests. #3 Engaging with Your Network. Finally; the new Linkedin Page has increased opportunity to engage with your community, with recent activity displayed at the top of your profile allowing you to stay current with what everyone (company or contact) has been sharing or doing. Edit your news feed with exactly what you want to see, and tailor stories and updates to your specific interests. Its probably quite easy to compare the new Profile Pages to a ‘Facebook Timeline’ sort of look; however the Linkedin version is much more than that. It is still better to have a Linkedin company page for advertising your company products and services in an efficient manner. See our Linkedin compnay page design info. The new profile is less about major changes to your page, but more about rearranging the pieces to make an altogether more competitive and functional jigsaw. With highlights of the most important part of your profile, whilst adding a less static dimension to your page, the new Linkedin Profile is overall very well designed in providing an improved social networking experience all round.